With his first composition, "Impressions of an American sparrow" for two pianos, won the "Valentino Bucchi" prize of Rome in 1986 and, two years later, he won the "Forum" prize of Cologne with "Tremiti" for string quartet. This piece, played by the Arditti Quartet and recorded by the German radio-tv station WDR, was subsequently also awarded the prize of the Kennedy Foundation of Washington. In the following years his works received much more recognition and began to be diffused throughout the world by internationally renowned soloists, ensembles and conductors. In 1992 Witold Lutoslawski, chairman of the International Contest of Warsaw, awarded his symphonic work "Spectra" that, also performed by the Warsaw Philharmonic Orchestra, was a great success according to both the public and critics. After two more prestigious international prizes (Jewish Culture Center of Los Angeles in 1994 - Tulane University of New Orleans in 1995), the "B. Barattelli Society" of l'Aquila, on the occasion of their fiftieth anniversary, appointed him to compose "Imis", a piece for seven instruments, which, among many other interpretations, was also played by the Ensemble Pierrot Lunaire at the Wien Musikverein. For the 'Giovine Orchestra Genovese' (GOG) he composed two works, the first in 1996 for the centennial of Eugenio Montale's birth, is "E piove in petto una dolcezza inquieta" for soprano and quintet on texts of the Ligurian poet and, in 1999, "Fiabe, miti e magie" for percussion instruments and piano. In 1997, in occasion of a commission by the Verdi Theatre of Pisa for a work dedicated to Arnold Schönberg, he presents himself to the public for the first time in the twofold role of composer/conductor: he performed the first execution at all of his work "Eco di un tempo perduto", in a concert that, performed at the presence of Nuria Schönberg herself, obtained great public and critic success. Since then, his intense composer activity has taken him towards the specialization in a repertory dealing with the music from '900 till nowadays, conducting and recording, as well as his own and great Nineteenth Century maestros' works, even the ones belonging to contemporary authors, also carrying out first performances at all and collaborating with soloists, ensembles and orchestras such as the E.Co. Ensemble, the Icarus Ensamble, the soprano Susanna Rigacci, the Chamber Orchestra and Symphony Orchestra of the San Marino Republic, the Janua Coeli Globus, the Flame Ensemble Orchestra, the Hofstads Youth Orchestra, the cellist Daniel Müller-Schott, the Carlo Felice Theatre Orchestra of Genova, the flutist Andrea Griminelli, the Tuscan International Youth Orchestra (TIYO), the Bayerisches Kammerorchester and Jacques Loussier with his Trio. 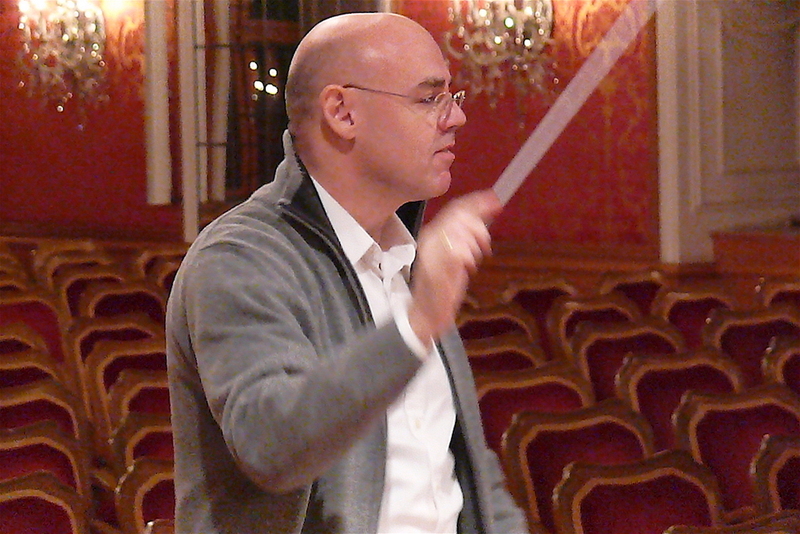 In 2002 he is appointed to conduct the Carlo Felice Theatre Orchestra of Genoa in occasion a concert dedicated to the music of Hans Werner Henze, who commented upon the performance writing that he had been "...very impressed by the vigour, the energy and the elegance of his interpretation". That same year the prize of the Japan International League of Artists of Tokyo – which he won for his setting to music of texts by the poet Montale – aroused the interest of the Genoa Opera Theatre which established to perform his symphonic work "E fu sera, e fu mattina" dedicated to the Genesis. Among the listeners was Riccardo Chailly, who arranged it other five performances in Milan, in 1998, during the season of the Verdi Orchestra. The same work, in 2001, won the international award of composition "Ciutat de Palma ", in Mallorca. Among the numerous performances and activities of the following years we can mention the piece "Come un'aurora" for string orchestra, commissioned by the Music School of Fiesole on request of Luciano Berio, in occasion of the inauguration, the 21st April 2002, of the Auditorium of the Parco della Musica in Rome, and the appointment to "resident composer" at the EinKlang Festival of Wien for the year 2003. In 2004 the Spanish "ACA Foundation" has published a monographic CD of his works and, the same year, the Harvard University gave him the "Fromm Award" commissioning also the new work for string orchestra "In memory of Carlo Walter Loeb". In 2006, the Detroit Chamber Winds and Strings, the University of Michigan and the Oberlin Conservatory of music, jointly commissioned him a new work ("Le immagini nascoste") for large ensemble that, first performed in october 2008 at the Oberlin Conservatory of Music, has been again played by the other two institutions in 2009. In 2007, he was named "Knight of the Order of Sant'Agata" by the Republic of San Marino for his work as a conductor. Again with the San Marino Republic Chamber Orchestra, he conducted in September 2009 at the Venice Biennale presenting also his transcription of the Debussy "Prélude à l'après-midi d'un faune", and, in occasion of 2010 edition, the "N. Paganini" international violin competition commissioned him "Kairòs", the compulsory piece for the competition itself.